Masha Gessen: Trump Doing “Incredible Damage” to Democracy While Media is Obsessed with Russia Probe | Democracy Now! an award-winning Russian-American author and journalist. She is a visiting professor at Amherst College and a regular contributor to The New York Review of Books and The New York Times. "The Future is History: How Totalitarianism Reclaimed Russia"
As the U.S. Senate Intelligence Committee says it has reached the conclusion that Russia interfered in the 2016 U.S. presidential election, and CNN reports a number of Russian-linked Facebook ads specifically targeted Michigan and Wisconsin, two states crucial to Trump’s victory in November, we speak with Russian-American journalist Masha Gessen. “We don’t know if there was a conspiracy,” Gessen says of allegations the Trump campaign colluded with Russia. “But even if there was, we should do our best to try not to engage in conspiracy thinking. … It lends itself to this idea that once we discover that Trump colluded with the Russians, that we’ll magically get rid of Trump.” She says it is unlikely the investigation will produce the kind of evidence of collusion that could be used as a legal basis for impeachment, and argues impeachment is unlikely while Republicans have control of both houses of Congress. AMY GOODMAN: This is Democracy Now!, democracynow.org, The War and Peace Report. I’m Amy Goodman, with Nermeen Shaikh, as we continue our conversation with award-winning author, journalist Masha Gessen, author of The Future is History: How Totalitarianism Reclaimed Russia. NERMEEN SHAIKH: I asked Gessen how she thinks President Donald Trump is distorting language. One example she cites in her piece is on NATO, that Trump first said that NATO is obsolete, and then later said it was no longer obsolete. MASHA GESSEN: The way that he’s mangling the English language is something that I think is so dangerous. And Americans are a little bit innocent to that danger. And this is where, oddly, you know, having grown up in the Soviet Union and then having lived in Russia as a journalist for so many years, I’m externally sensitive to what happens to language. And I’ve talked to two Italian journalists about this. Italian journalists, I mention because they lived through a much sort of milder form of what I observed in Russia. But they say that Berlusconi, over 20 years of his reign, did so much damage to the language that they’re still recovering their ability to describe what they’re dealing with. Right? And so, Trump does two things. He uses words to mean their opposite. So when he does things like, you know, he calls the Russia investigation a “witch hunt,” it’s the opposite—he uses the phrase “witch hunt” to mean its opposite in several ways. And the most important of them is to reverse the relationship of power, right? I mean, a witch hunt, by definition, used to be something that people with power could perpetrate upon people who didn’t have power, right? Here’s the most powerful man in the world saying that he is the victim of a witch hunt. But he also just uses words to mean nothing. Like a thing cannot be first obsolete and then no longer obsolete, right? That reverses sort of our understanding of time and words. And both—these are distinct kinds of damage to language, but they make our shared reality mushy, right? Because how do you use terms that no longer mean anything or have come to mean their opposite, which also is a way of meaning nothing, right? And as a journalist, I have worked in a language that has been violated in similar ways, first by the Soviet regime using words to mean their opposite, where, you know, literally, “freedom” was—the word “freedom” was used to mean “unfreedom,” and the word “democracy” was used to mean “tyranny.” And then, under Putin, I observed words being used in very much the way that Trump uses them, just to mean nothing, just to create a kind of cacophony in which you never can get a grasp of what’s going on. And Trump is doing both. And that’s going to make our recovery from Trump, which inevitably will come, that much more difficult. AMY GOODMAN: I wanted to ask you about Trump’s attraction for Putin, why you think that is, and if Putin has the same feelings about Trump. NERMEEN SHAIKH: Eight-six percent popularity, that’s what Putin has. MASHA GESSEN: Eight-six percent, that’s what Putin has.That’s what Putin has, and that is a totalitarian-level number, right? That’s when you know you’re no longer talking about public opinion, because there is no public and there is no opinion. You’re just taking the temperature, sort of, of totalitarianism in the country, and it’s pretty damn high. And that’s what Trump sort of instinctively aspires to. It’s not—the feeling is not mutual. Putin thinks that Trump is a clown. He’s made that abundantly clear. AMY GOODMAN: What’s the word? So, Fareed Zakaria, who comes up for the second time today, during an interview in Moscow in September of 2016, asked Putin, you know, “You called Trump brilliant. Why did you do that?” And Putin, you could just see how thrilled he was, because, very much like Trump, he loves it when journalists are wrong. And so he says, “Well, I never said that. Why do you believe things you hear? If you go back to what I said, I called him colorful. He’s colorful, isn’t he?” And that—you know, that just sums of his attitude toward Trump. 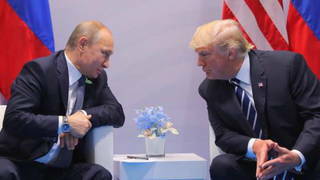 Every comment he has made since and sort of the way that Russian television has treated Trump, it either portrays Trump as the man who affirms Putin’s power, because, of course, Russia is very happy with the narrative that Russia elected the American president, or they treat Trump as a bumbling idiot who can’t get anything right, including his relationship with Russia, which, you know, for all the Russia conspiracy, the relationship between the United States and Russia has never been worse. I mean, it hasn’t been worse since the end of World War II. We are deep into the territory of mutual diplomatic expulsions. At this point, the Russian—the American Embassy in Moscow and the consulate in Saint Petersburg have been forced to stop issuing visas to Russian citizens, because they are so poorly staffed that they actually can’t process visas. I mean, we are on the brink of actually losing diplomatic relations altogether. AMY GOODMAN: Masha, you are the author of The Future is History: How Totalitarianism Reclaimed Russia. You’ve been fiercely critical of Russia. You’re fiercely critical of the Trump administration. But you’re also fiercely critical of the story that has predominated now of Russia’s interference with the U.S. election that ended in the victory of Trump. Why? MASHA GESSEN: Well, because, you know, I just need more things to be fiercely critical of, obviously. But I think—and this is a word that also has almost lost its meaning, because we use it so much—in a way, it’s a distraction. Right? And this is a very difficult point to try to convey—right?—that I think that conspiracy thinking is really dangerous to culture and to political culture. And it’s very hard to stay away from conspiracy thinking when there may have been a conspiracy. Right? We don’t know if there was a conspiracy. But even if there was, we should do our best to try not to engage in conspiracy thinking, for a couple of reasons. One is that it lends itself to fantasy. It lends itself to this idea that once we discover that Trump colluded with the Russians, that we’ll magically get rid of Trump. That’s not going to happen, for two reasons. One is that it’s extremely unlikely that the investigation, when it’s over—and it’s going to drag on for a long time—but it’s extremely unlikely that it’s going to produce the kind of solid evidence of collusion that would—that could be used as a legal basis for impeachment. But even more important, there’s not going to be any impeachment as long as Republicans are in power in both houses of Congress. Right? So, there isn’t a straight, direct line from any kind of conclusions from the Russia investigation to getting rid of Trump. But more important, it creates this fantasy that we can find a reasonable explanation for the election of Trump that will somehow let us out of this national nightmare. And the national nightmare is that Americans elected Trump, and he’s president. Russians didn’t elect Trump. Even if there was collusion, even if every hypothesis that has—that is at play in the Russia investigation is proved, still, Americans elected Trump, and he is president. And he’s doing incredible damage to this country, while so much of the media is obsessed with proving the Russia stories—story. And, you know, every American citizen has limited bandwidth, even if the internet has unlimited bandwidth. And so, the more we engage with the Russia story, the less we engage with our lived reality of destruction of democracy in this country. NERMEEN SHAIKH: Well, in that sense, as you say in your piece, in one of your pieces, this whole investigation into Russia is actually helping Trump, and the media’s obsession with it. Could you talk about the role of the intelligence community in media reporting on Russia? MASHA GESSEN: So, I think this is one of the most disturbing things about especially the early coverage of the Russia theory—right?—which was that all of the early coverage was driven by leaks from the intelligence community. Now, the problem with leaks from the intelligence community—the problems are obvious, right? One is that they can’t be corroborated. Two is that your sources control the timing and sort of the dosage of the leaks. So, basically, journalists become mouthpieces for people in the intelligence community who may or may not be pursuing their own goals that have nothing to do with informing the public. Their job is not to inform the public, right? That’s the media’s job. But a close enough relationship gets the media out of the business of informing the public and into the business of being mouthpieces for the intelligence community. And, of course, we should be highly skeptical of anything that comes from the intelligence community, based on the experience that American media have had recently, you know, during the careers of many of the people who are covering the leaks now, of leaks being used to mislead the American public in fundamental ways. NERMEEN SHAIKH: Well, you said earlier, Masha, that one of the problems with this obsession with the Russia investigation is that it prevents us from thinking about why Americans elected Trump. Now, in one of your pieces, you talked about the effects—I mean, the kind of looking at the longer view—the effects of 9/11 and the concentration of power in the executive branch. Can you say what you think some of the historical—although not that long ago—reasons are that Trump was elected? My argument is basically that our Reichstag fire—and the Reichstag fire, as I’m sure you know, is, in 1934, the Reichstag, the parliament building in Berlin, burned, and Hitler, who had just recently been appointed chancellor, used it as a pretext for restricting political freedoms in really profound ways, in ways that—to create a state of exception, what his favorite legal theorist, Carl Schmitt, called a state of exception, which is when the sovereign claims extraordinary power. Well, I think that that has all happened in this country, and it happened in the wake of September 11th. The state of emergency that went into effect three days after September 11th has never been lifted. It was renewed by President Obama every September for seven years of his presidency, the seven Septembers that he was president. We continue to be in the state of emergency. The War Powers Act passed with one dissenting vote three days after September 11th, continues to be in effect and has been used by President Obama and now by President Trump. And there’s also been a 16-year run of concentrating—increasing concentration of power in the executive branch—under George W. Bush, basically, in the interest of shoring up more military and surveillance power; under President Obama, for some of the same and some other reasons, having to do with a Congress that was intent on paralyzing him. But basically, I think that chain of events did a lot to create the possibility of Trump, to create the very possibility of a politician who could run for autocrat in this country and get elected. AMY GOODMAN: Award-winning author and journalist Masha Gessen. Her new book is The Future is History: How Totalitarianism Reclaimed Russia. It’s been shortlisted for the National Book Award. When we come back, Congressmember Nydia Velázquez has just returned from Puerto Rico. Stay with us.